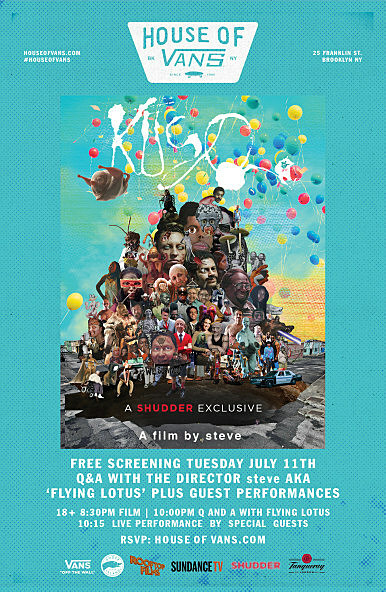 Flying Lotus‘ feature film directorial debut, Kuso, will hit theaters July 21 and will also be available to watch via new horror/thriller/cult streaming network Shudder. The film, an aggressively weird sensory overload (and gross-out extravaganza), was too much for some Sundance Film Fest viewers who walked out of screenings, but others have called it an avant garde delight. It features Hannibal Buress, Anders Holm (Workaholics), Tim Heidecker, and George Clinton, and could well be the weirdest thing you’ve seen since Part 8 of Twin Peaks: The Return. You can watch the Kuso trailer below. If you’re in the NYC area you can see Kuso for free at House of Vans on Tuesday, July 11 and there will also be a post-screening Q&A with FlyLo himself, and then an after-party sponsored by Goose Island and Tanqueray, featuring guest DJs. It’s free and RSVP here to attend. There is also a midnight screening at Nitehawk Cinema on July 12 with FlyLo in attendance as well, which is sold out, Kuso will also screen at Nitehawk on July 21 & 22 (tickets).